Dating sites and apps love to boast about their new features, niche audiences, and sophisticated algorithms, but, ultimately, what singles really want to know is: Does online dating really work? It’s a daunting proposition to put one’s personal information, photos, and hopes/dreams on a dating site, so before taking the plunge, singles often want assurances that they won’t be wasting their time. They want to feel confident that they can find the date or relationship they’re looking for. Exactly how successful are these technological tools at hooking people up in the real world? Well, we’ve pulled some numbers to give singles a sense of the most impressive accomplishments in the online dating scene. Read on to learn about online dating’s most important claims to fame. But, seriously, there’s no stigma anymore. In 2016, only 23% of Americans agreed that people who use online dating are desperate, and 59% said online dating is a good way to meet people. What’s more, online dating has become the number one way singles meet date prospects. According to Match.com’s statistics, 27.5% of singles said they use online dating to meet people to date. Only 22% said they meet dates through their friends, 7% meet at a bar or club, and 6% at a social event. Meeting people is all well and good, but singles probably also want to know if those online connections will lead to a real-life relationship. According to eHarmony, about 20% of today’s relationships begin on a dating site. One in 5 committed couples said they met online. Additionally, 7% of couples who got married in 2015 reported meeting one another on a dating platform. These numbers are encouraging, and they’re always growing as more couples meet, date, and tie the knot. Match.com is the oldest dating site in existence, and it has a well-earned reputation as an effective dating resource. Since 1995, singles have used Match to find love and relationships based on common interests. Millions of people have successfully met their match here. Today, Match proudly promotes itself as the most successful dating platform, responsible for facilitating more dates, relationships, and marriages than any other dating site or app. 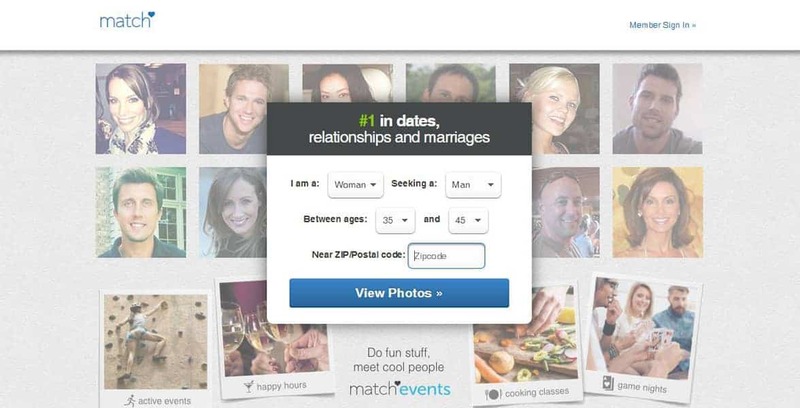 As the oldest and most successful dating platform, Match.com has clout in the dating industry. In fact, Match declared in 2013 that people who joined the site were three times as likely to find a relationship as those who didn’t. Tinder is an undeniably popular dating app with over 50 million members in 190 countries. Its innovative mutual matching features forever changed how online daters viewed one another, and, for better or worse, its swiping has become an integral part of dating lexicon. Is it successful? Heck yeah. Tinder facilitates 1.6 billion swipes per day, which lead to 20 billion mutual matches. When all is said and done, Tinder users collectively go on over 1 million dates per week thanks to the app. In 2010 — two years before Tinder launched — eHarmony conducted a survey that found the dating site was responsible for approximately 100,000 marriages a year in the United States. That works out to around 2% of all marriages. That’s an impressive accomplishment at a time when online dating hadn’t yet picked up steam. It wasn’t a mainstream resource, but eHarmony had already made a name for itself as a remarkably successful dating platform for straight, monogamous couples. In 2015, eHarmony’s membership reached an all-time high of 778,000 members, and the dating site made nearly 15 million matches per day. We’ve established that online dating is a good way to meet people and even end up in a long-term relationship, so the next question is: How likely is it that those relationships will last? Researchers have good news for commitment-oriented folks on a dating site — couples who meet online are less likely to divorce than couples who meet almost any other way. According to a study on marital satisfaction, only 6% of couples who meet online reported breaking up versus 7.6 of couples who meet offline. In its own study, eHarmony found couples who meet on eHarmony are roughly 67% less likely to get divorced, while couples who meet at the bar are 24% more likely to get divorced. Online dating has been around a long time — Match.com launched in 1995 — and it has evolved significantly since those early days. The top dating platforms have spent decades perfecting highly effective techniques for connecting singles with one another. Today, many longstanding dating companies boast high success rates and claim responsibility for billions of matches and millions of marriages worldwide. Dating sites and apps rely on their successful track records to convince singles to give online dating a try and see what it has to offer them.